Ray Fawkes a critically acclaimed writer and artist based in Toronto, Canada. His work has appeared online and in print around the world, and he is a two-time nominee for a Shuster award as "Outstanding Canadian Comic Book Writer". He ranges in style from dark, visceral horror (Mnemovore, Spookshow, Black Strings) to slapstick and black humor (The Apocalipstix, Possessions), and has been published by DC/Vertigo, Oni Press, Tor.com, Top Shelf 2.0, White Wolf Publishing, and more. He is an Eisner, Harvey, and three-time Shuster Award nominee, and a YALSA award winner for Possessions. His recent book, One Soul, was nominated for the Eisner and Harvey Awards, and followed by The People Inside. 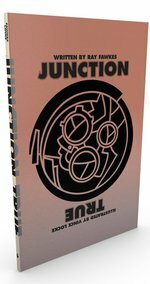 Ray's graphic novel Junction True (with Vince Locke) will debut from Top Shelf in 2015.